You have to grab 57 Str / 18 Dex from some gears/jewels. Bis. Huge mobility boost. You dont need to grab damage in this slot. +1 curse corruption is not mandantory. Patient Reaper(70% increased recovery rate) also affects the life regen. Awesome! I just started to make one like this and hopefully I can now follow this. I'll support this build! Thanks! Hope you enjoy this build. Add / Update some sections. How this build will feel in HP version, while doesnt have any good ES items? Also, will be it good in lvling from start? Or better take another skill? It's my first character on Harbinger League. So I started this build in Life + MoM. MoM is very powerful right now, easily to get 4-5k life pool. Yes, Life + MoM is good for leveling. When I hit certain level, got "OK" ES gear, respec to CI. It was 7-8k ES. This is one of the reasons that I dont recommend to go life version in end game. You can easily get high es pool than end gear life build. And it will be 10k+ es if you have good gears. ES gears now days are not expensive. It's not popular like previous league. ED is good for leveling. Sometimes you might be lack of damage against tanky boss. Swap ED gem to Blight will help this situation alot. Or another 4link Blight setup is also good. 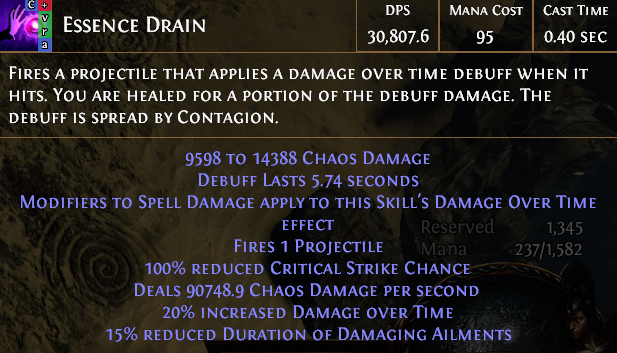 It has x3 dot damage at max debuff stacks. You have on your amulet +1 curse, and on tree third one. But you use only 2, why then? Did i missed something on your gear, or you're running anything with support (aurabot)? Also, if i dont have empower, what can i place in 6l? Let me answer your question a bit as i understand it and author will correct my answer later. As for curses, he uses 2 curse spells + Witchfire flask which applies 3rd one on its duration. Instead of Empower you can try Pierce to make speed clearing packs even faster or Poison singletarget-wise. As ascendary author uses Patient Reaper, Shade Form and Swift Killer. We should wait for author's answer about their order of importancy tho. After all, I'm very thankful to Koshiniki for this build. I used to level ~87 trickster in Harbinger on almost this build but with MoM, then looked deep into top level tricksters, especially Koshiniki's one (he was like 97-98 lvl back then), and realized CI LL-build. Spent lots of time thinking about pros and cons and loved his build so much that created one more trickster to follow Koshiniki's build with. Then I occasionally looked into forum and found this new topic here and was like LOL. 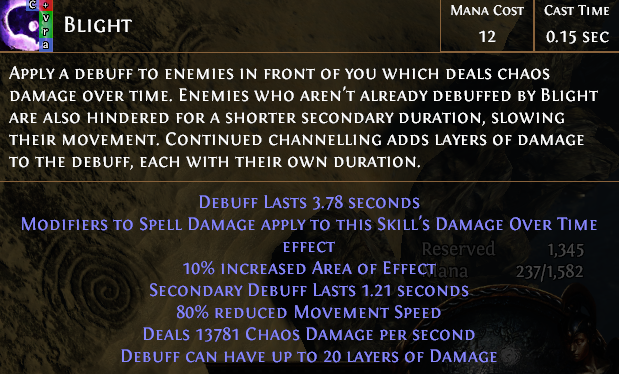 The only thing I miss in ED trickster build is boss killing efficiency, but I guess there aren't such builds in PoE that combine speed-clearing and boss-killing at their best at one time. By the way, what do you think about Allelopathy gloves which give 22 lvl Blight? BF berZerker still so much OP.